What is an Ohio Last Will and Testament? 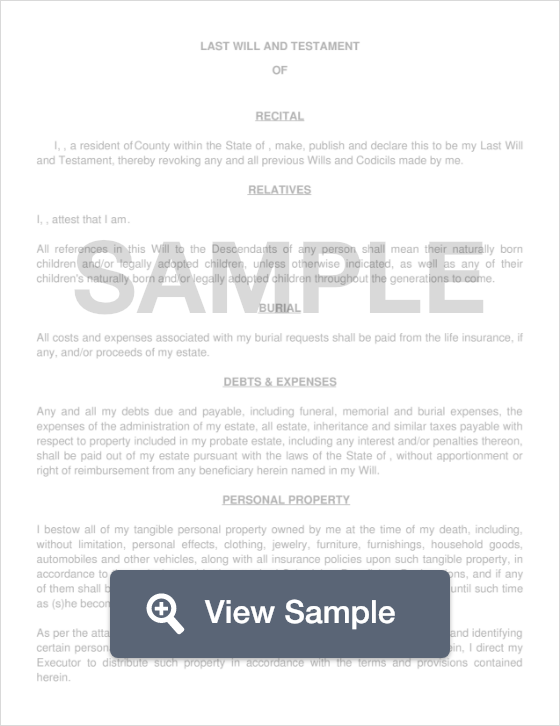 Ohio Last Will and Testament: What Is It? A Last Will and Testament is a document that ensures that a person’s (known as a Testator) wishes are followed in regards to what happens to their assets, and belongings after they die. Oftentimes, a Testator will use a Will to leave an inheritance to their children and grandchildren, but these documents can be used to donate assets and estates to charity, and dictate wishes toward the funeral service and last meal. Witnesses - According to ORC 2107.03, the Will must be signed by two (2) Witnesses in the presence of the Testator. Step 4 - Provide information on your pets, your property, as well as the details to your life insurance policy. Step 6 - If you have any children, provide information on them, in addition to whether or not they will be named as beneficiaries. Step 7 - Provide the information if you’d like to set up a Trust for someone. Setting up a Trust for someone who is mentally ill or disabled can prevent them from being disqualified from their benefits. Step 8 - State the age that children must be to start receiving their benefits. Also, state the age that they will be when benefits end. Also, state the portion or percentage that they will receive. Step 9 - Describe whether or not the Grantor has a specific funeral home that he or she would like their body taken to. If so, input the name and address of the funeral home. Step 10 - If the Grantor knows where he or she would like the meal after the funeral service to be held, as well as any other burial arrangements, specify that information. Step 16 - Additional Beneficiaries - If there are people besides your children who you wish to name in our Will as beneficiaries, be sure to name them here. Be sure to have your witnesses sign your WIll in your presence. In addition, remember to have your Will recognized by a Notary Public.